When rapid and efficient transportation is the priority, there is no better vehicle than the MonoTracer. On Saturday, September 3, 2011 MonoTracer owner Shinji attended the gaming and science fiction convention Dragon*Con in Atlanta, Georgia. Shinji captured this fun photo with Stormtrooper TK-421 revealing that the MonoTracer is the Speeder Bike of choice when patrolling planet earth with the requirement of rapid and efficient transportation. All that is missing is Princess Leia with a Luke Skywalker TK-421 riding “blaster” as the MonoTracer comfortably accommodates two people. 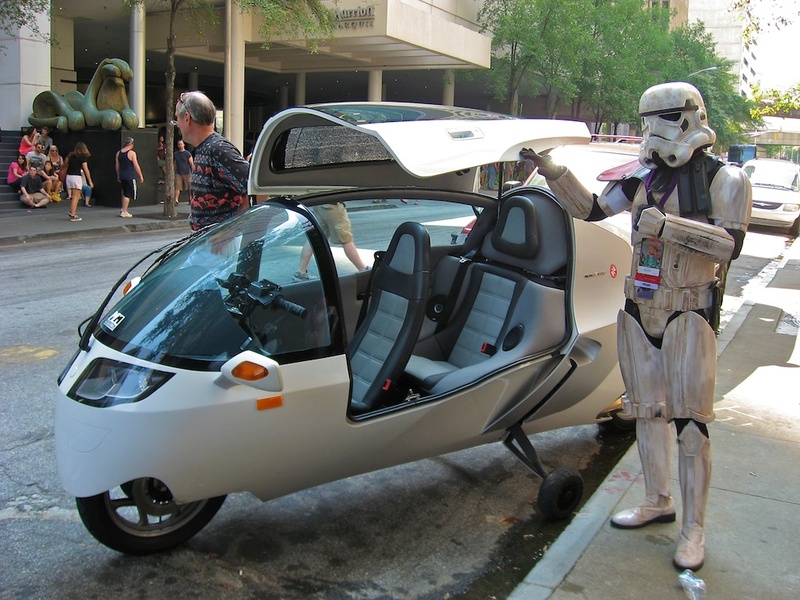 While the particular vehicle in the photo is a MonoTracer i1200, the photo caption imagines how a Stormtrooper might comment upon seeing a zero emissions all electric MonoTracer e150 which sounds very much like a Speeder Bike from the movie under acceleration. See the below video clip for the classic Return of the Jedi Speeder Bike chase scene on the planet Endor. This entry was posted in Peraves and tagged Dragon Con, Dragon*Con, e150, electric, i1200, Luke Skywalker, MonoTracer, Planet Earth, Princess Leia, Return of the Jedi, Speeder Bike, Star Wars, Stormtrooper, TK-421. Bookmark the permalink.